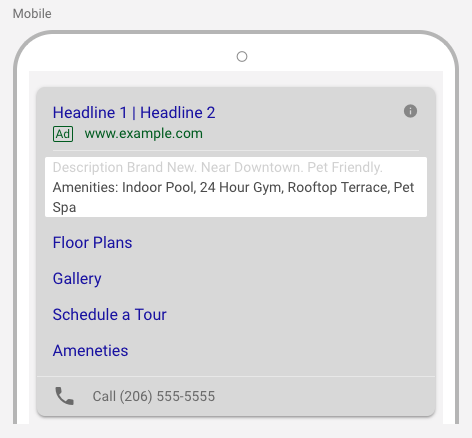 With the addition of expanded text ads, your ads now have the potential to show up to three headlines and two descriptions, with a guarantee to showcase at least two headlines and one description. 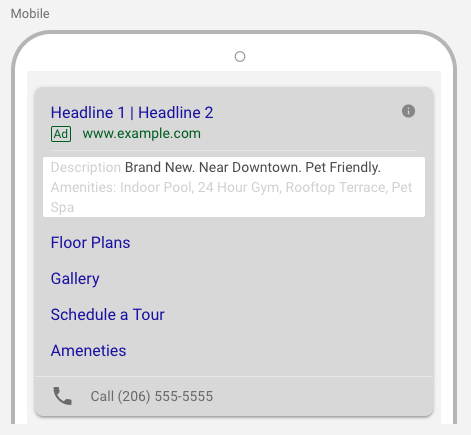 Headlines within your text ads are limited to 30 characters and descriptions are limited to 80 characters. One important thing to note, ad extensions don’t always appear when your ad is served in the search engine. Only ads that receive a higher position and rating by Google will showcase your ad extensions. 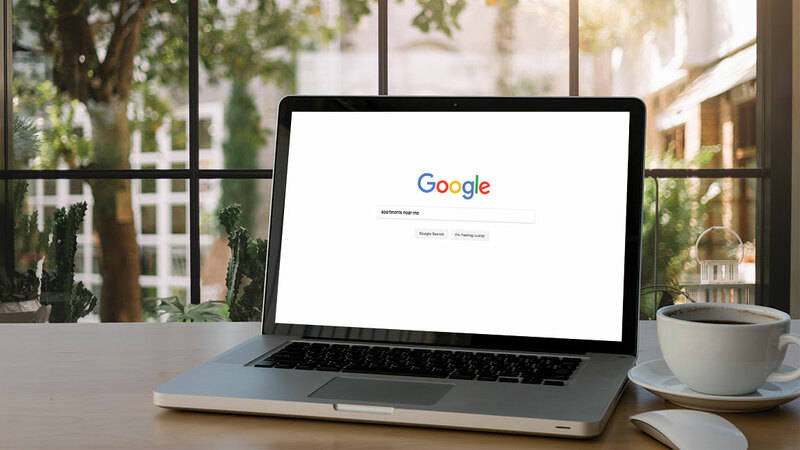 In order to increase the likelihood that your ad extensions will show, you will need to continually review and manage your ads, keyword choices, and your budget allocations. While there are a multitude of paid search ad extensions, not all of them are practical for apartment communities. 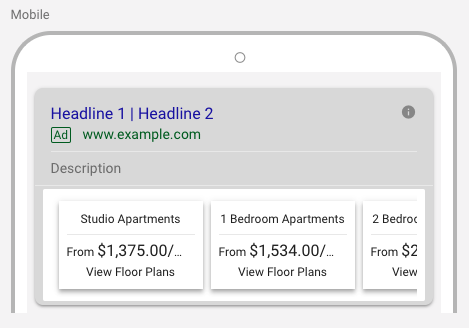 In this article, we share the extensions we’ve found to be the most beneficial for apartment Paid Search campaigns. If you have multiple pages on your website, sitelink extensions provide more links that prospects can click on to get to your site. 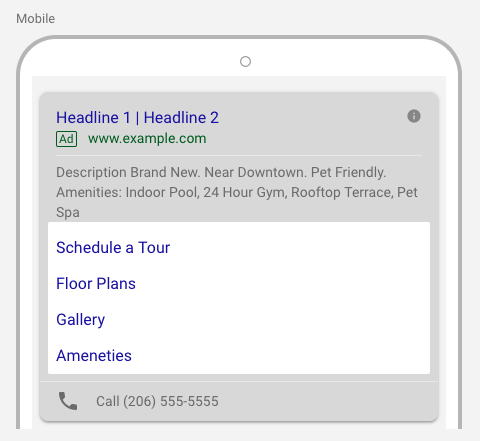 An ad with sitelink extensions present can showcase 2-6 links and expand your search ad by one to two lines, increasing your visibility in the search engine. For those prospects who are searching for communities online, and already know they want to go straight to the floor plans page or see what the community looks like in the gallery, sitelink extensions make them more likely to click on your ad. Callouts are phrases that show up underneath your description copy that give you additional text to communicate your community’s value propositions. Examples of the types of callouts communities can use in an ad are: “Pet-Friendly”, “Ocean Views”, “Centrally Located”, “Brand New”, or “Newly Renovated”. 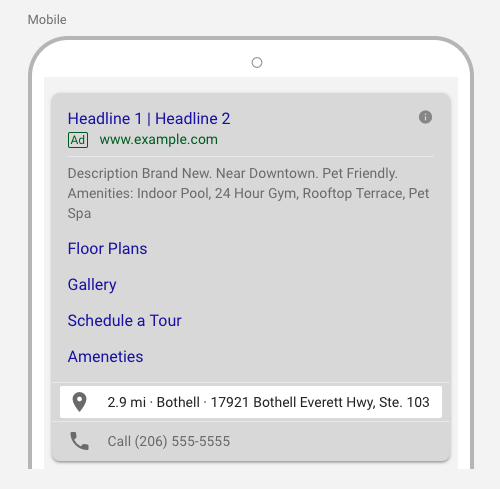 Structured snippets give you an extra line of copy to list tangible aspects of your community. The way structured snippets are used can vary from industry to industry. While most industries use this line to show off their list of service or products, a community can use this extension to highlight the amenities they have to offer. This is another great way to differentiate your community from the others listed next to you in the search engine. 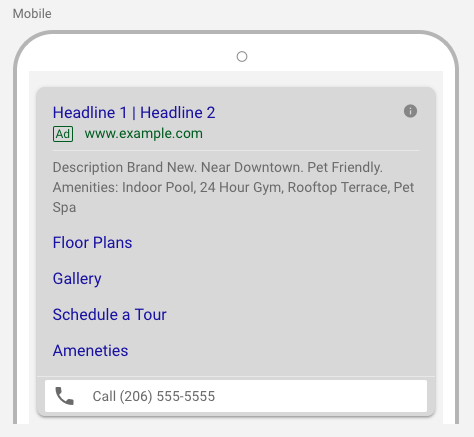 Call extensions add a clickable phone number to your paid search ad. An apartment seeker using a mobile device can click on your call extension and call your community directly from the ad. This extension is great for capturing hot leads who are really interested in a community and are ready to call to set up a tour. Call extensions also give you the ability to attribute calls to your community from a specific marketing channel. Location plays such a big role in a apartment seekers’ decision to lease an apartment. This extension adds a link to your community’s address on Google Maps so that prospects can see where your community is located. You must register your community in Google my Business for this feature to show up. If you are marketing a luxury apartment community, it makes sense to feature your pricing upfront so that you only attract and (pay for) quality leads to reach your site. Price extensions allow you to feature the prices of your units within your paid search ads. Alternatively, if you want to feature below market pricing, price extensions can help you show off your affordability.